We had Maya’s birthday this weekend. It seems the older she gets, the longer her birthday lasts. This one was about 24 hours. It’s still easier, though. The kids are largely civilized and can amuse themselves. Two of her friends came over Saturday afternoon, played around and then we took them to dinner at an atrocious place called Lone Star – their choice. It’s ‘tex-mex’ food. (I’ve been to Mexico, although not Texas, and nothing I ate there was anything like this stuff, I have to say.) It is very loud there. J taught all the kids about horse-racing and then sat them at the bar to watch a horse called Big Brown lose the 3rd leg of the Triple Crown. The girls were worried about J when that happened – “Are you sad?” There is a very large emotional gulf between 12-year-old girls and 40-year-old men. There’s also a very large physical gulf between girls at that age. When kids are Boo’s age – 5 – there are some who are larger and some who are smaller, but they all look pretty much the same – 5. Maya’s 3 friends (the third joined us later) are coincidentally all born within 6 days of each other and are all 6 months younger than she is. One is now the same height I am, wears a bra and has acne. 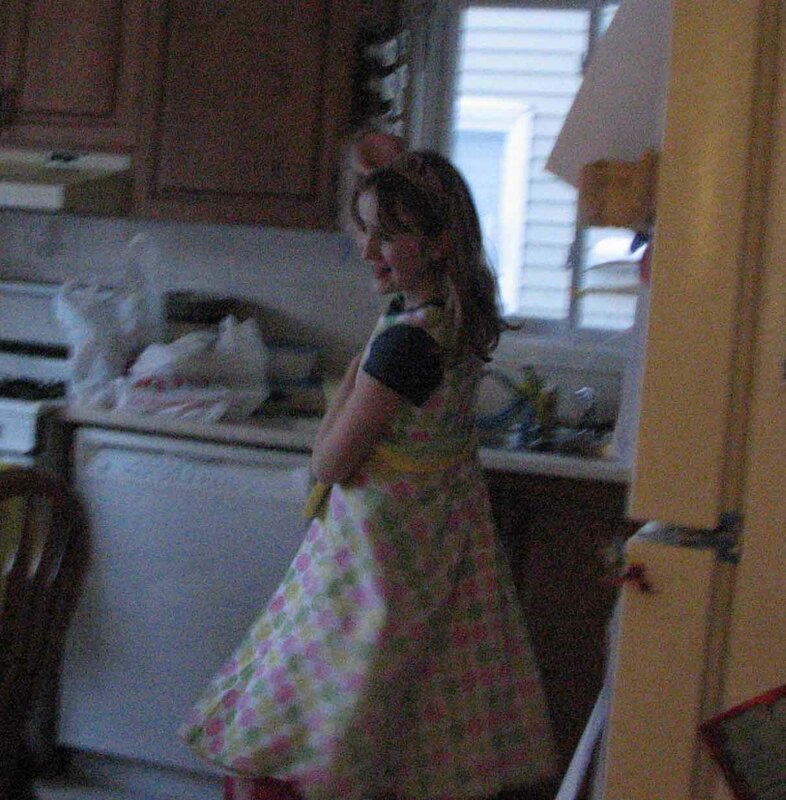 If it weren’t for her blatently (and appropriate, of course) childish demeanor, she could easily pass for 16 years old. Another is shorter than Asher and could easily pass for 8 years old. 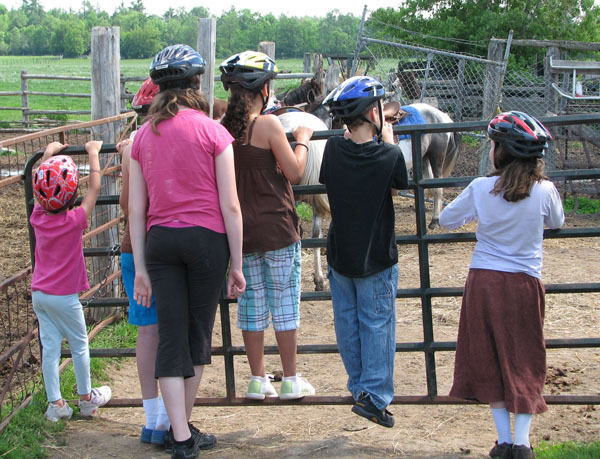 They had a sleep-over, then the third girl joined them Sunday morning to go horse-back riding. The third kid, S., is very Orthodox – no driving on Saturday (making attending the sleep-over too difficult), no food she didn’t bring herself or was unopened and bearing a hecksher (kosher symbol), etc. She did add a challenge to the organizing. We worried about how she would ride while wearing a skirt, we worried about the cake, which she wouldn’t eat, what she would do at the splash park afterwards. The cake was ice cream, but we needed an unopened container of ice cream for S, plus plastic cutlery and dishes. It gave me added insight into why those involved in very Orthodox communities tend to stick to themselves – trying to function in the rest of the world is downright complicated. It all worked out, though, and the kids appeared to have a great time. Next up: Boo’s birthday, which she has only been planning since the last one. Well. It got hot, didn’t it? I’d mind more if I were up to doing anything, which I am not. When I was in the hospital, my improvement was fairly steady. Very early on after I awoke, there were some scary moments, such as when they discovered a new infection and wanted me on more antibiotics, thereby increasing my chances of getting the drug-resistant c. difficile bacteria. I feared anything that might set me back, but I was very lucky and nothing did. Day after day, I saw improvements – the abdomen tube was pulled, then the chest tube, then I could straighten my hands, touch my face, type on a keyboard, sit in a chair. In rehab it was even more effective. I stepped up one step the first day, the 4-stair case they have the second. Two days later, I did the stairs twice. Some people told me that rehab would be the hardest thing I ever did, but they were wrong. It was great. I worked hard and my muscles responded quickly and every day was better than the one before it. When one of the physiotherapists told me that part of my success lay in my positive attitude, I told her that it was easy to be positive when things were going so well. The moment I hit any sort of speed bump in my road to health, she’d see a different person. I’d become discouraged and down immediately, I warned her. I saw hints of this in the ICU, where it took nothing more than a nurse suggesting I try to pull myself to standing alone and me failing. I’d burst into tears immediately. I knew that once I was sprung from the hospital, my improvement would slow, and it did. But I still managed to improve. I went from a 15-minute dog walk to a 35-minute one. I went from plodding slowly up the stairs while using my hands on the railings to help to walking up at a relatively normal speed while holding stuff in my hands. If I’m lucky, the hernia can be fixed at the same time as my colostomy will be reversed, which also isn’t a given. If not, two more surgeries! It depends exactly where the hole come from – my incision or my groin. I get an ultrasound for that. Either way, I get to live with this for months. The practical issue is that every time I stand up, my guts drop out of the great big hole in my abdomenal muscles and punch against the skin, which hurts. Then I walk around with a big, tender lump in my lower belly. That also hurts. And whereas I used to be able to carry non-heavy stuff, now I can maybe a paperback book. Right now, if I want to walk any distance at all, I have to wear this torture device called ‘support underwear’ until I find a hernia belt. So I suddenly find myself being able to do less than before with no chance of improvement for some time. I can’t lift, I can’t walk. I can’t stand for any length of time. Hence, the sulking. I told J how I was feeling kind of down by this turn of events, and he said encouragingly, “At least you are alive.” And that is a good thing, don’t get me wrong, but after a while, ‘you aren’t actually dead’ seems not much of an accomplishment. At least I can write. That’s a little better. Check out the cool rainbows. This is the view from the back of our house a few days ago. 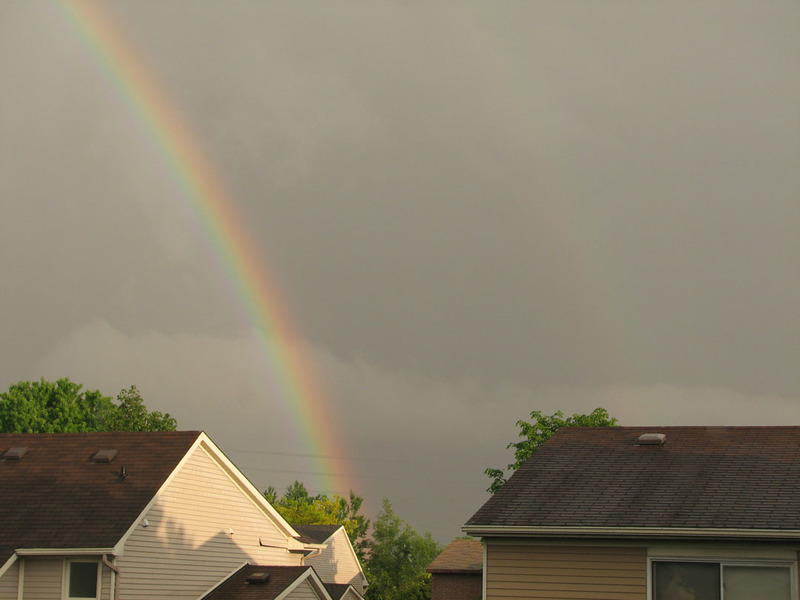 On some monitors it shows up better than others, but there are actually two rainbows in this photo. 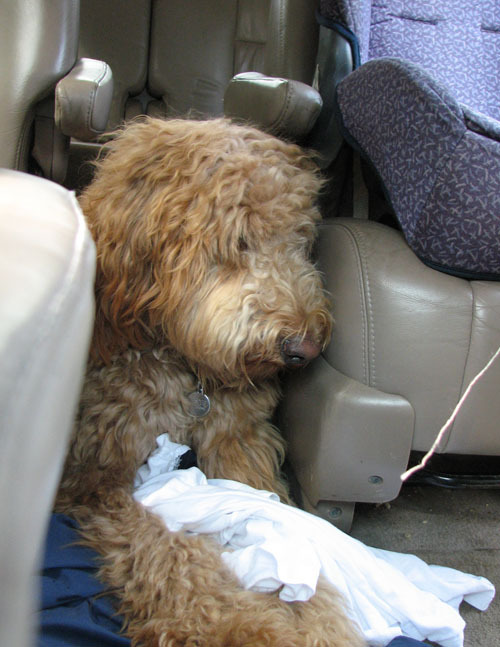 He had gone to the still-open car door, hopped in and lay down. No coaxing would get him out. If we were going anywhere else, he was going with us, damn it. And he was in luck, since we did go to my folks’ for dinner, where he got to play with their dogs. On the positive side, I’m pretty sure those aren’t original lyrics. I suppose I shouldn’t expect anything else from a kid whose favourite song is Nelly Furtado’s Maneater.